The fully remodeled first floor apartment opens up to the quietest, most exclusive block on Sol Street and offers a tranquil Patio with a private fountain. All rooms are decorated with high quality furniture and selected artwork, the kitchen is fully equipped including a washer/ dryer & the bathroom is nicely designed. 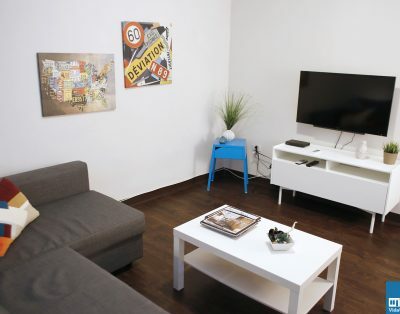 The apartment has WiFi & Cable TV and sleeps up to 2 persons on 1 king size bed. The property counts on an onsite manager available from Monday through Friday for any additional request. “Casa Mar y Sol” has 3 additional apartments in the very same building. All of our 4 apartments at “Casa Mar y Sol” have an outdoor space, either patio or terrace/ sun deck, have 1 to 2 bed rooms with A/C and quality furniture, each bedroom has its own bath. The apartments have fully equipped kitchens with dishwasher, washer/ dryer and all utilities are included for weekly rentals. Monthly rental rates include an obligatory basic weekly cleaning, exterminating and A/C cleaning when needed and all utilities with a reasonable gap.